The other day I was looking/researching plants which is what I do in my spare time (Which these days is non-existent) and I came across something interesting. Surprising to me anyway. I’ve always been drawn to Mimosa trees, when they are in bloom they are so beautiful, little pink wisps for flowers and they smell amazing. Did you know that the flowers have a medicinal use? I wouldn’t have ever dreamed that they would but from what I’ve read, they can help aid in stress relief. 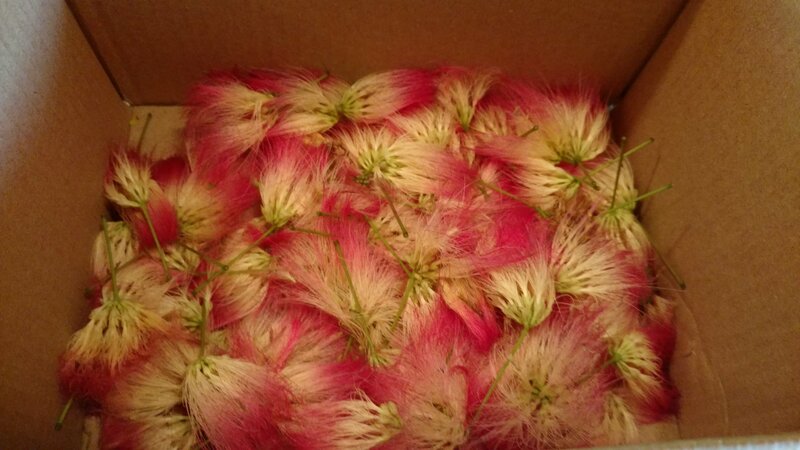 You can make a tincture with the feathery light blossums. 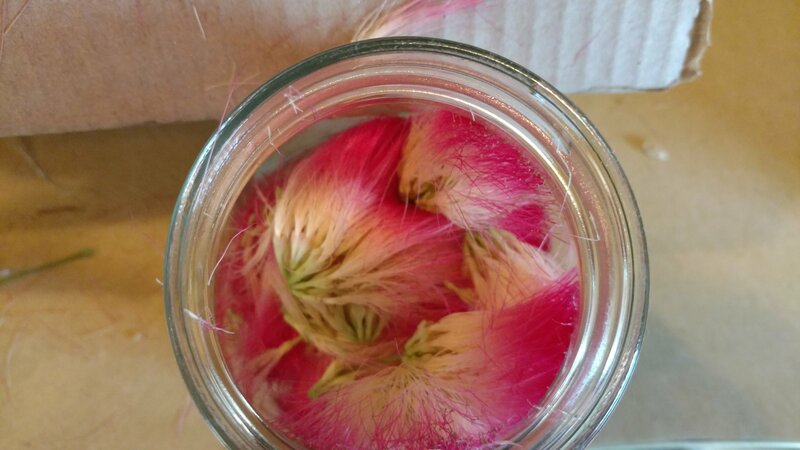 If you follow my blog at all you should know how to make a tincture but basically you take vodka (or vegetable glycerin if you worried about the alcohol) and pour it into a mason jar over the mimosa flowers in this case and seal with a lid. Put in a dark place and shake it every couple of days for about 6 weeks. The vodka is able to pull the plant properties out and when it’s done you strain it and write the date on the lid. As far as how much to take… I would treat it like any other tincture, just a dropperful under the tongue. Hope you all found this as interesting as me. Mimosa is more than just a pretty face for your yard, it also has added use! Disclaimer: These statements have not been evaluated by the Food and Drug Administration. The information from Blue Missouri Skies Homestead is not intended to diagnose, cure, treat, or prevent any disease or be taken as medical advice. It could just be me, but I feel like hunting morels use to be this little secret that wasn’t really broadcasted. The locals knew what time to look and would slip into the woods unseen and come back with golden treasure to fry up in a few days for a scrumptious dinner or in Jeremy’s grandma Juanita’s case: Breakfast. Now it’s… Trending. For me, I grew up with it. 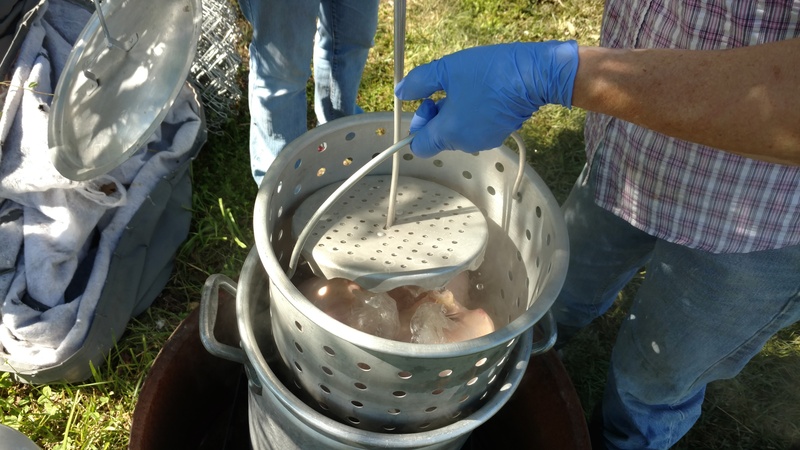 We always looked to April and May with anticipation and hope of detectable fried goodness. To be honest though, the best part is the thrill of the hunt. But it seems now that mushrooms are in and trending. I’ve seen several blogs post about how to find them, wild foraging, wild crafting, etc. I’ve heard people actually follow morels up the states. They start in the warmer ones and work their way up until they are gone for that year. 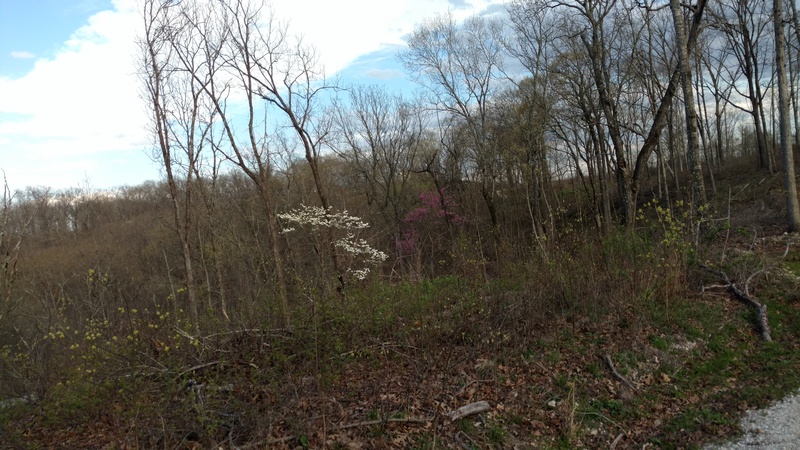 Missouri’s season is usually mid April to mid May but this year’s season as far as my location… Wasn’t so great. We had two batches we fried up and that was it. 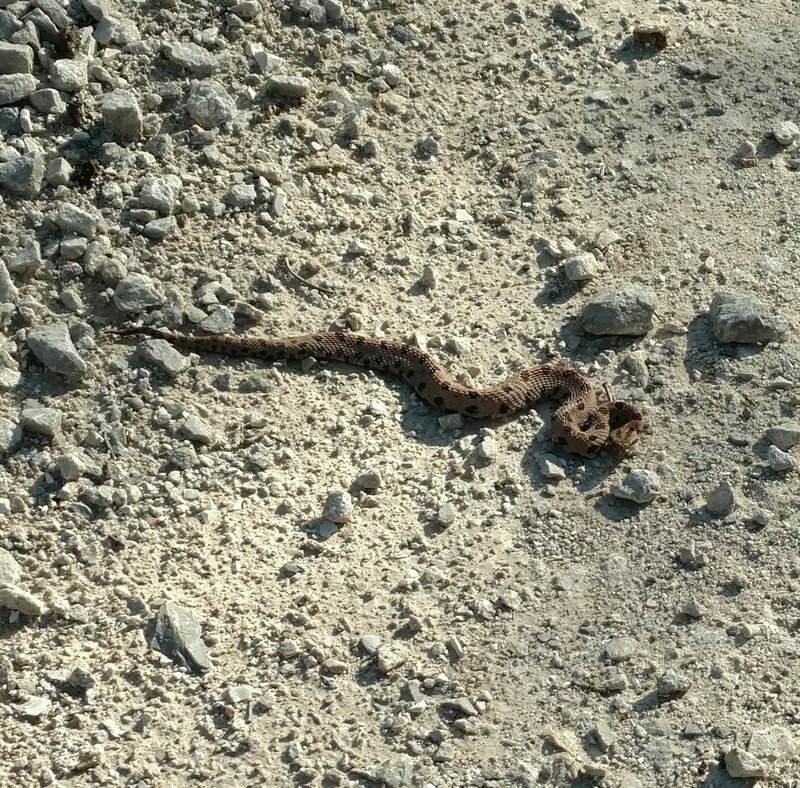 When you do go out to hunt, be careful of snakes! One of my last trips, I ran into this guy and yes, he’s poisonous. 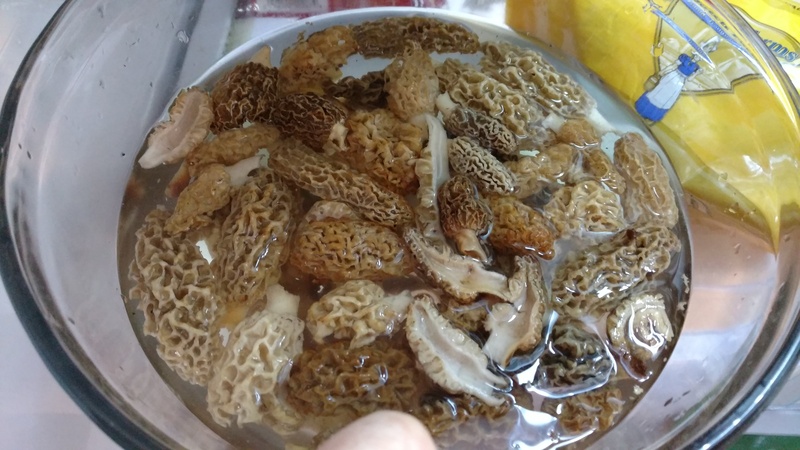 In my experience, growing up I always found morels below my mom’s property under sycamore trees… Which send odd to me now because I never find them there anymore. Most of the time I find them at the base of oak trees. What you want is warmer temperatures during the night and warm days as well as rainy days. They need moisture and warmth. I’ve never really thought about it, but I had someone say they looked like brains as a description to someone new hunting them but I guess they kinda do. If you haven’t ever gone… GO. It’s really fun going especially with friends. 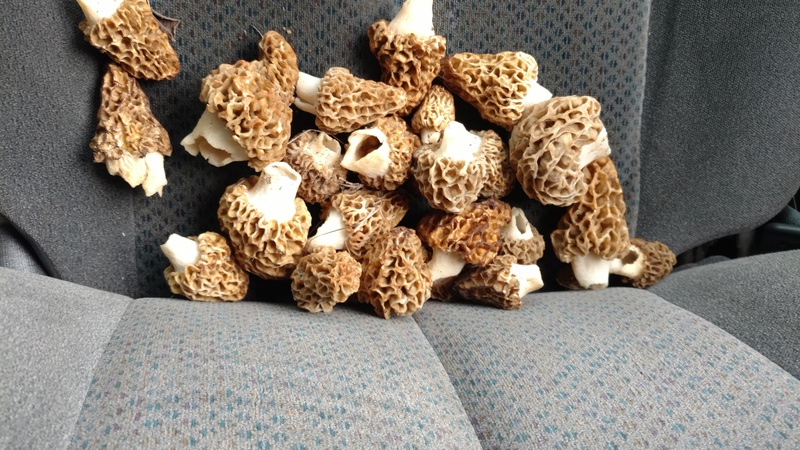 Anyone have any good mushroom hunting stories to share in the comments??? I don’t know if most of you will appreciate this but I feel like it’s an article/how-to that is necessary for a sustainable farm. There are some things I refuse to do, others I refused to do and was told it was an essential part of surviving on the farm (Yes, from the husband). In this world/society, I know we have food available right out of the grocery store but there’s something about knowing where your food comes from and how better to know exactly what process it went through and how unlikely it is that you’ll get e coli poisoning, and whatever other crazy germs seem to being presenting themselves on our chicken these days. (If you want to know more, I suggest watching Food Inc it will definitely open your eyes) Most of it is being shipped to China and is constantly being refused because there are metal pieces in it! Eck. Eek. Yuck. YIKES. So, this is me warning you ahead of time: VIEWER DISCRETION IS ADVISED. I don’t want you opening up this post to see blood and guts and not be warned. Though it will take a little bit of reading so you have time to change your mind. So is it a step you want to take? It’s for sure something to think about. 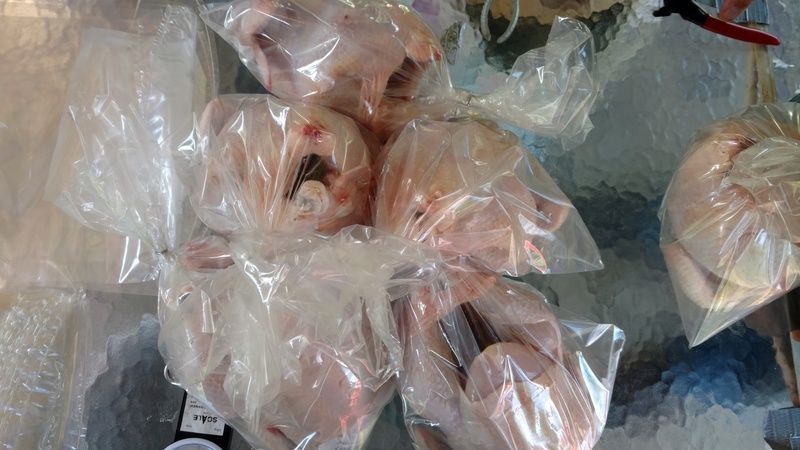 In the end it’s pretty similar to a smart chicken being bought out of the store but is cheaper money wise but hard work and less germ yuckiness. The best way that I know is to talk to your friends. The more birds you get, the less they will cost and if you have people interested then most likely they will pay for you to take care of theirs if you have the room and they don’t. Also, that’s extra help which means, assembly line! Which means getting done faster and running like a finely honed engine. If every “station” has a hand on deck then the whole process moves along fairly quickly. Meat birds… They really aren’t as sweet. At first, it’s not too bad but towards the end, they just want food and they can get kind of mean. By that, I mean when I went to feed them one afternoon in flip flops, they bit me! I don’t mean a little peck like most chickens, I mean bit me! So one, I learned to wear boots from that point on and I wasn’t completely against butchering to tell you the truth. It’s honestly like raising milk cows which become part of the family versus feeder steers. Feeder steers. You just don’t get close to feeder steers, those are the rules. They aren’t pets, their food. 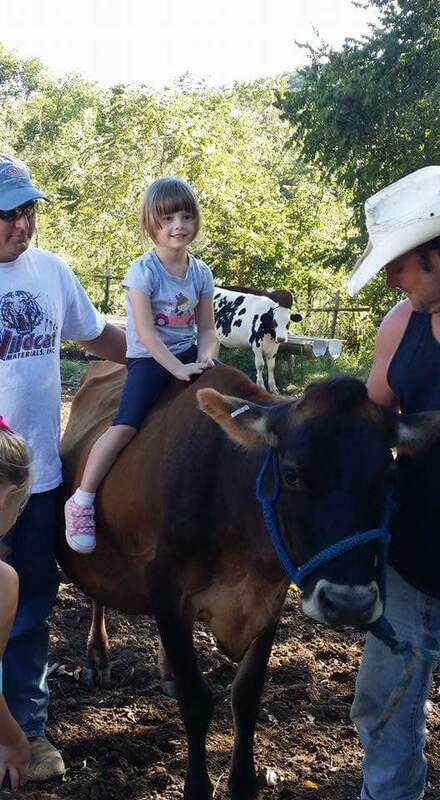 Milk cows are pets, put your affection to them, not your steers. I should also mention I refuse to medicate my birds. What’s the point in all this if you aren’t going antibiotic free? 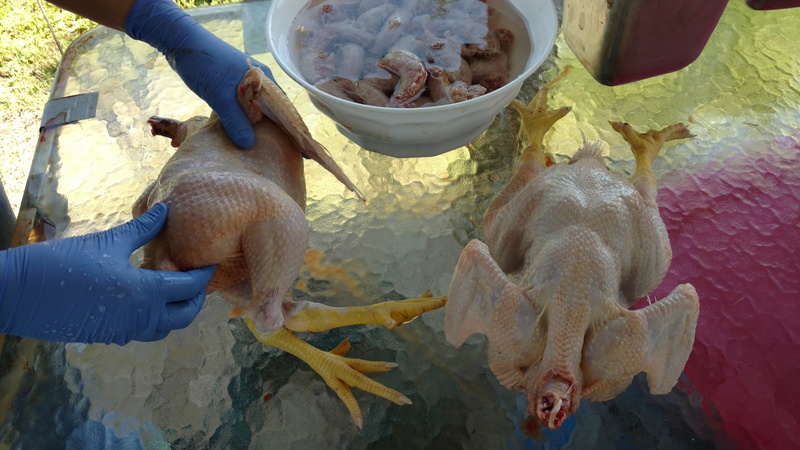 Anytime I raise chicks meat or laying, I use natural remedies to avoid antibiotics. 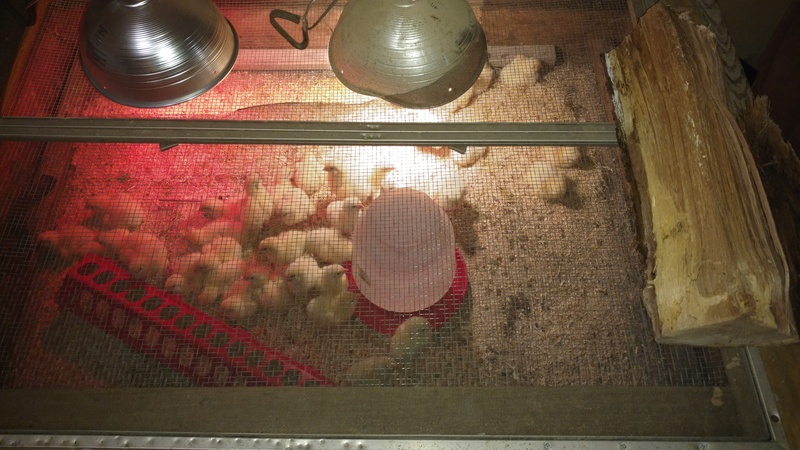 One of the biggest reasons that people started using medicated feed for chicks was because in the big industrialized chicken farms there were so many that you wouldn’t be able to tell which ones were sick (and coccidiosis was the big issue and spreads to other chickens through feces) so it can get out of hand pretty quickly. Instead of trying to keep track it was better for them to medicate as a safety precaution. 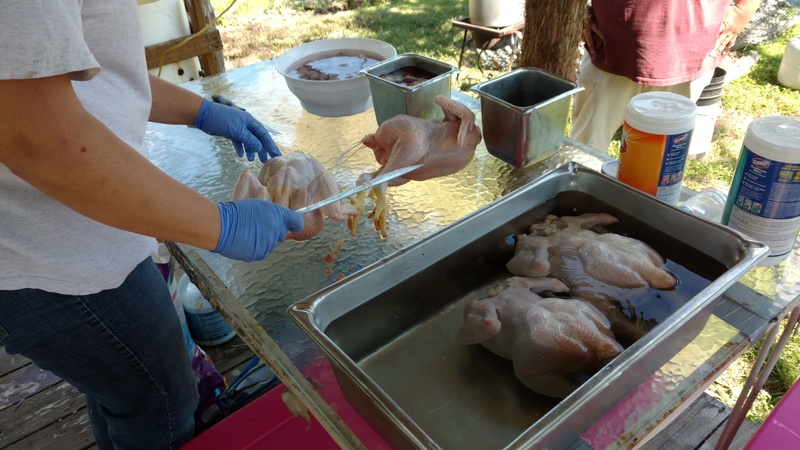 All chickens have Coccidian protozoa present in their intestines. The problem is an overgrowth of the protozoa that leads to them getting sick. As far as a small farm, it doesn’t seem necessary to me. Especially since Apple Cider Vinegar is around; add about 1 TBS to your gallon waterer and you’re all set. Here’s a link to basic use of ACV and here’s one that’s helpful on this particular subject. The last one is a great article that was very helpful in proving what I already knew to be true. 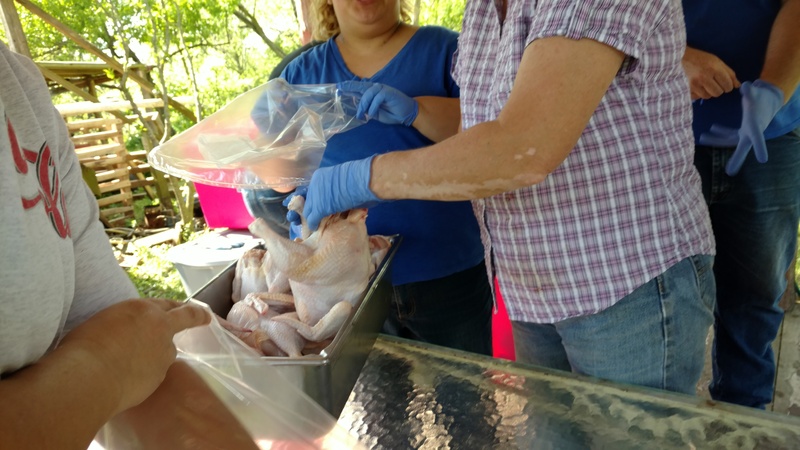 Feeding an animal doesn’t seem that complicated but with meat birds you need to pay closer attention. My in laws have been doing this for over 30 years and learned some lessons the hard way, by doing it of course. They have lost a lot of chickens in the past and have perfected it to where they hardly lose any at all now. So, just needs more effort on your part. You’ll need quite a bit of stuff initially but once you have this it can be a once or twice a year thing and can be stored together for later use. I feel like I should also say, you can spend extra money and buy specialty stuff like stainless still but to me, bleaching everything before you start… Seems to do the trick and I’ve never been sick from one of our birds. But this is your choice and I’m mentioning this now because maybe the pics won’t look “professional” but this is what WE do. It’s your call on what YOU do. Just something helpful we have learned is to pick your butchering times in spring and the fall so you miss the flies and the heat. The night before you need to take the food away from the birds. 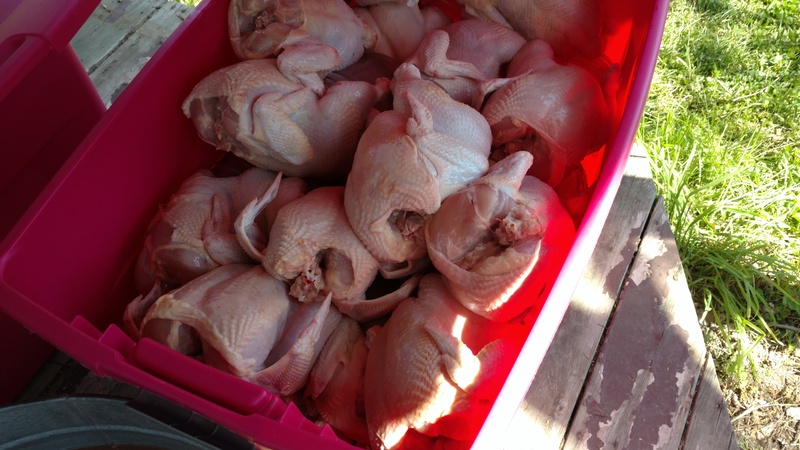 You don’t want to process a bird and have it full of… Processed and unprocessed food, its gross and smells awful. First, set up your work area. Each task is a station. An off-with-their-heads-area-the stump with two nails and axe. 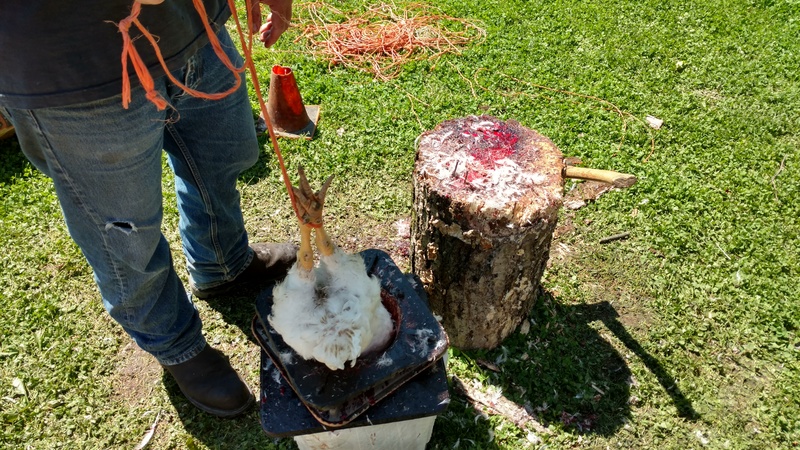 You put the chicken through the cone and put its head between nails and pull slightly, aim tour axe and use enough force otherwise… You have to do it twice like Bethany did and it’s not as clean and… Just not great. 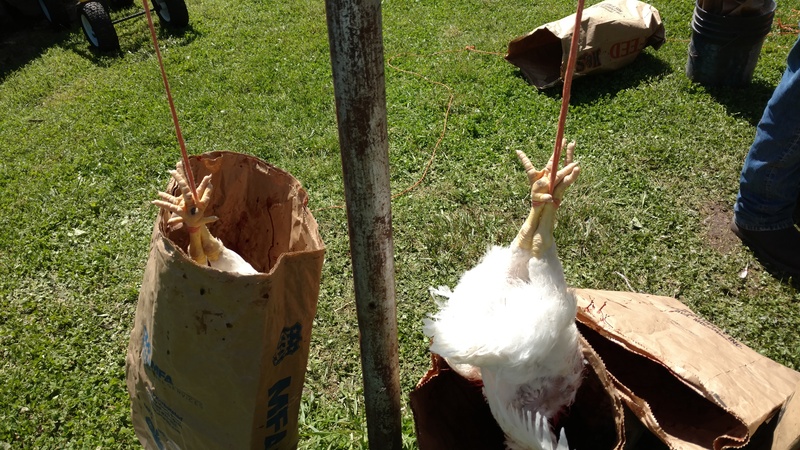 (There’s another method which involves just hanging bird upside down and cutting jugular but it just wasn’t for us) After this step have the bucket close and transfer to it. Square part of cone holds it in place. You then need to be able to hang birds to drain, we use Jane’s clothes line post. Once the bird is completely drained of blood it needs to be dunked in water. 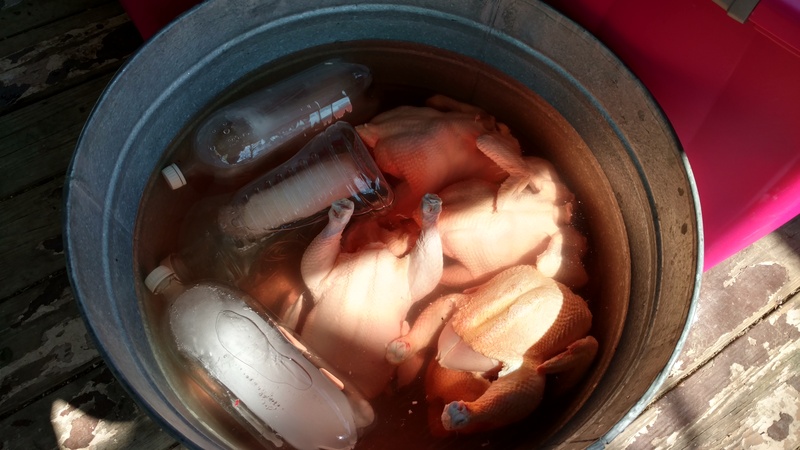 Boiling area-has to be at temperature and you soak holding feet to make sure legs stay under water and after about 45 seconds check to see if feathers pull out really easy. 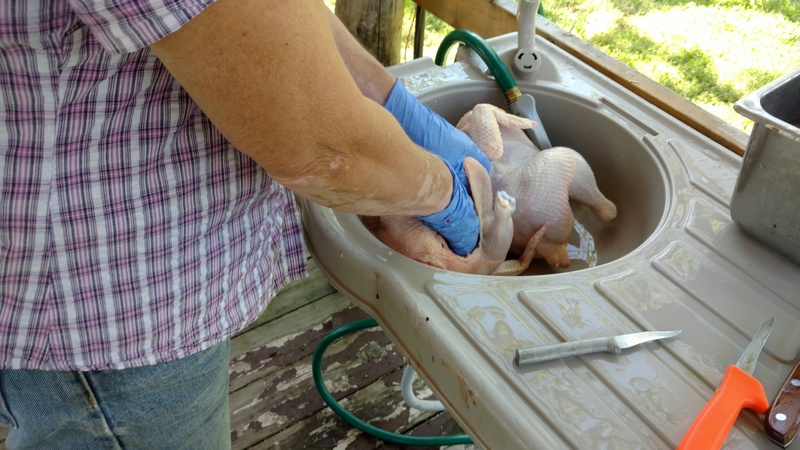 From the boiling area it goes to the plucker, from the plucker it goes to get the neck and legs removed, then to the processing area, it goes to the check and rinse station. 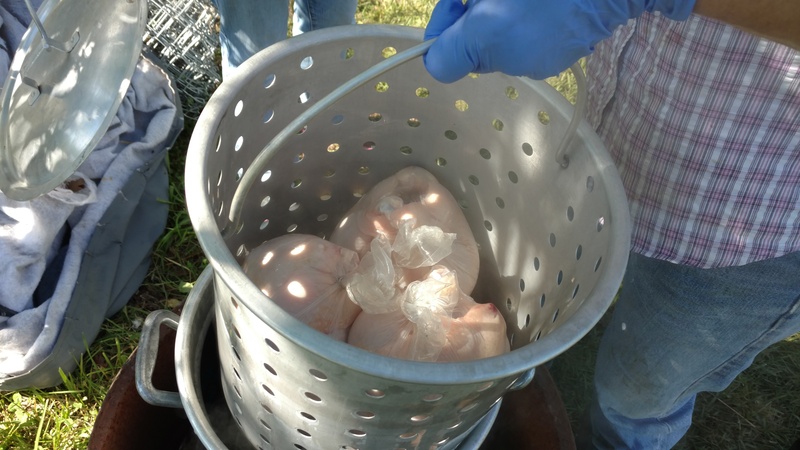 From the check and rinse it will go into water to soak 2 and 3 at a time and then goes into a big galvanized pot in ice cold water where it will stay until you put about 20 birds in then it goes into tubs with lids and a frozen ice water bottle is put inside the chicken so it freezes as much as possible from the inside. They wait there until it is time for bagging. 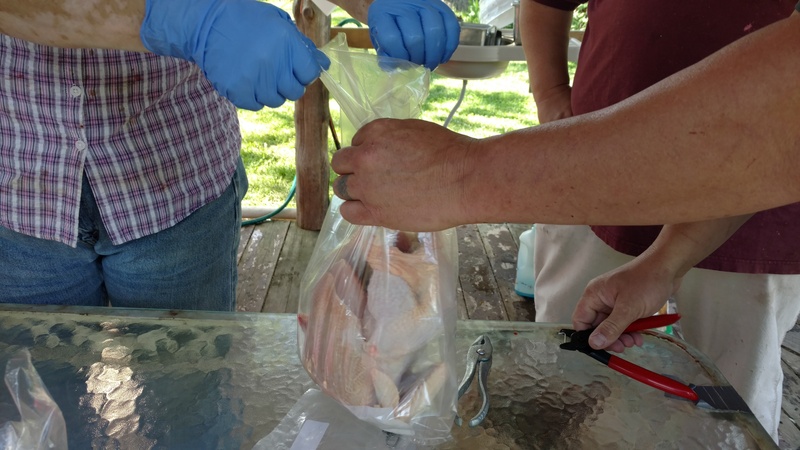 With bagging, we form an assembly line at a longer table and one person holds the bag, another tucks the legs and puts the bird in the bag, another twists the bag, one clips the bag, one pokes holes in the bag (so when it shrinks the air gets out that way), one takes and dips 3 at a time in boiling water and the kids that are there are usually the runners. They take them to the freezer. Making wine can be pretty cheap if you wild craft your berries or grow your own fruits. I haven’t made a strawberry wine yet but this year I plan too since my mother in law (aka Superwoman) usually has extra and last year I planted a strawberry bed so maybe I should have my own. I’m pretty excited since they are local to my climate here in the Ozarks. I purchased them from Simmons Plant Farm out of Arkansas. They ship them when it’s time to plant. The prices are great and everything I ordered and planted grew awesome, even asparagus which is hard to grow in my opinion. If I buy from a place like Lowes, the plants never seem to do good at all. Although this year, I’m planting my comfrey beside them in hopes that my fruit trees that I did buy from Lowes will perk up. Back to story, I never wanted to really make wine or have an interest until I was watching The Legend of Mick Dodge and on an episode he goes throughout the forest to collect a gallons worth of wild berries to make “Forest Wine.” Which he collects then mashes the berries together, adds water and heats and adds yeast as well. He just puts into 1 wine bottle. I thought, if it’s really that simple I’ll do it. 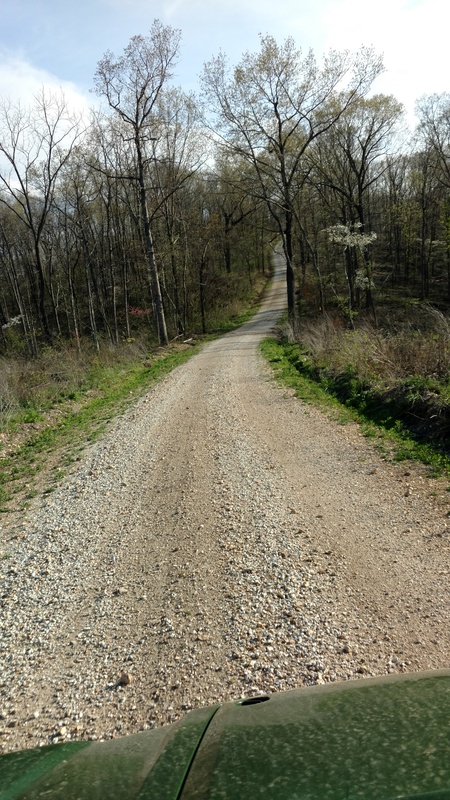 In the town of Ozark, we have a place called Home Brewery where they have anything and everything you would need to make wine, beer, mead, cheese, yogurt…. The list goes on. They sell EVERYTHING you need to become a home brewer. I highly recommend stopping by if you’re local to Ozark, MO or close by and even if you’re not you can order online. They are super helpful and no matter how many questions you ask…(I always ask A LOT!) They are a laid back bunch that want to help you as much as possible. They also give you a recipe to make a basic fruit wine. I haven’t moved past basic yet since I’ve only made 5 batches (Mulberry, Blackberry, Plum, Blackberry-Raspberry, Pear Apple) The best tasting was my last which I cracked open last night… WOW! Soooooo goood, which was the Blackberry-Raspberry. When I went in trying to explain that I just wanted simplicity like Mick Dodge the guy tried to explain that yes, theoretically, it would be wine. If you watch the video, there doesn’t seem to be any sugar added and the guy (I think Todd from Ozark Brewery) said that for a good fermentation you need sugar (Without the addition of sugar… You might not havegreat alcohol contents, it would be classified as wine but only certain grapes, some pears, and cider apples to well without the addition of sugar) and after it is wine I can only imagine the amount of sediment it would have in the bottom and actually it would probably be half full with it. After it’s all said and done and Mick Dodge has “wine” it probably wouldn’t taste that great. It’s actually easier to just be sure you did everything right and there’s no contaminants or wild yeasts going all crazy in your wine. If you watch the episode that I linked above, you’ll see the wine is a gooey mess. They explained if you want something clear that looks like wine, you’ll need to clarify it. You need to think about sanitation as well. 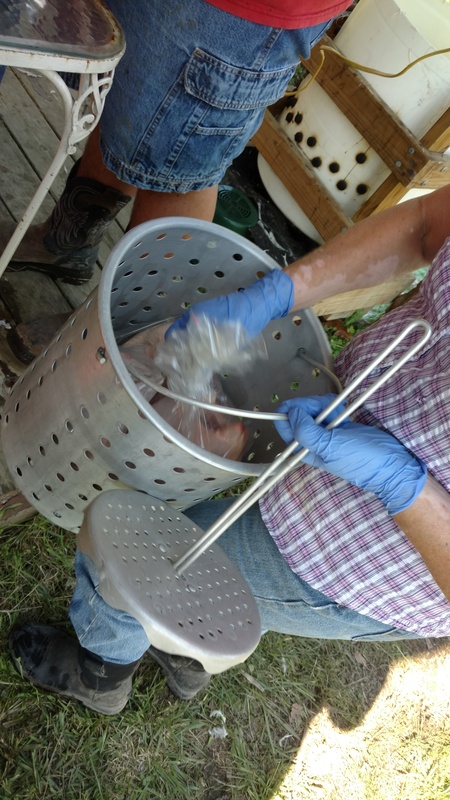 I thought it would be expensive and it can be if you do the kits or whatever or buy juice but if you harvest your own fruits–that’s pretty inexpensive. So the only things you need are equipment and things like sugar, water, fruit/juice, pectin enzyme, yeast nutrient, acid blend, campden tablets, potassium sorbate, and your wine yeast. I definitely assumed that would be expensive but each one of those things is $2 each and the wine yeast is cheaper than that. Pectin Enzyme: Breaks down the cell walls, fiber or pulp of fruits to facilitate juicing and extraction of color and flavors. Also helps prevent pectin haze. Yeast Nutrient: Yeast Nutrient is a combination of DAP (diammonium phosphate) and food grade urea. These provide yeast the vitamins and nutrients they need to thrive and encourages faster and more complete fermentation. 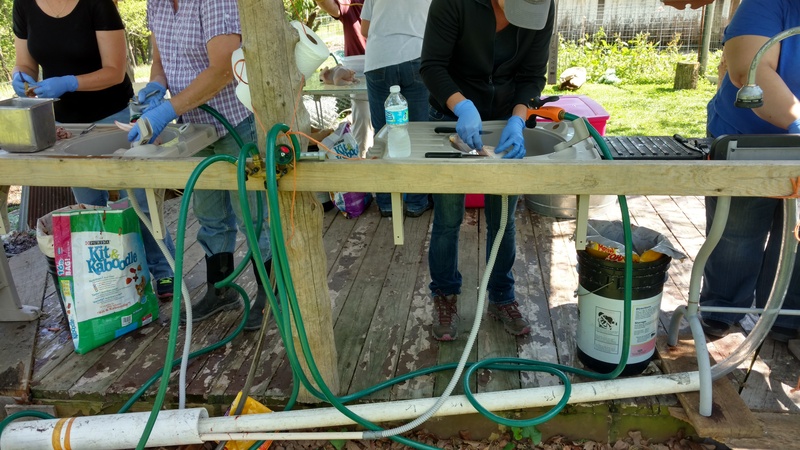 Campden Tablets: A convenient way to sterilize your must and accurately sulfite your homemade wine. (Kills wild yeasts) Contains Potassium Metabisulfite, which acts as a sterilant and antioxidant when dissolved. Potassium Sorbate: Stabilizer, used after fermentation but before bottling, that inhibits yeast reproduction. Recommended to be used with Potassium Metabisulphite (Campden Tablets) to fully stabilize a wine before sweetening and bottling. Stabilizing prevents re-fermentation inside the bottled wine which can produce sparkling wine (at best) or worst case scenario – popped corks or exploding wine bottles. 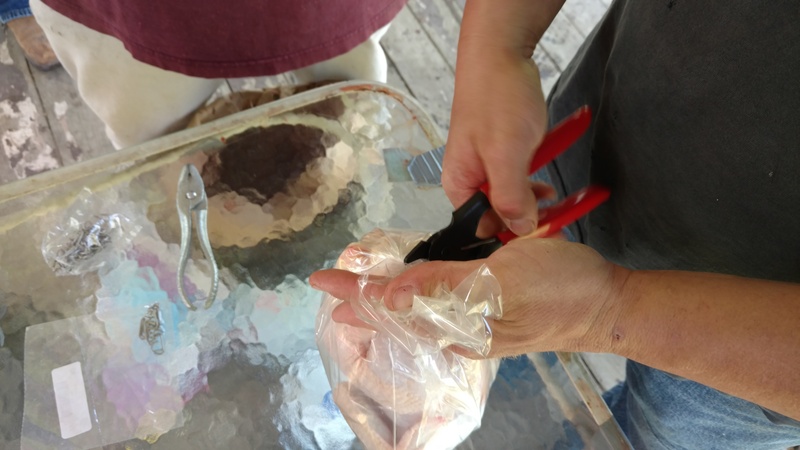 Stabilizing is critical if you plan to sweeten your wine. I will say: For equipment you do need to make a few investments but in the long run–it’s not that pricey. So a startup cost but you have a waiting period since things have to ferment. Buy what you need to start like your gallon jars with lid, air lock, stopper, and your straining bag if you do it that way and that’s it other than your ingredients. Wine bottles: You can buy these but I just ask people for their leftover bottles. People usually throw these away. Glass is reusable so I remove the stickers and sanitize before using. Hydrometer: You can measure the alcohol content using these but I really don’t care too much about that. I do have one but hardly use it. You can get fancy and get labels but… I don’t. I usually just use a sharpie and write it on the bottle. The easiest way that works for me… I pick my fruit and put it into a crock pot and let the juice work it’s way out of the fruit and then i strain and press with a sieve and get the most juice I can. The biggest thing about making wine is waiting. It feels great to know you made this. You took the time to pick the fruit/grow it and then you got the juice and you added everything together rather simply then waiting for the fermenting, then the clarifying and low and behold, it is wine. The sweetening is the best part. You get to taste and adjust… That’s the wonderful thing about making your own wine. I hope you experiment with this simple thing and reap the benefits. I love to do it. I like making it more than drinking it. Having the satisfaction that I made it myself is exhilarating to me . I share it with friends and family… Anyway, let me know if you guys try it! Or have done it already! 1 gallon batches make 5 bottles of wine. 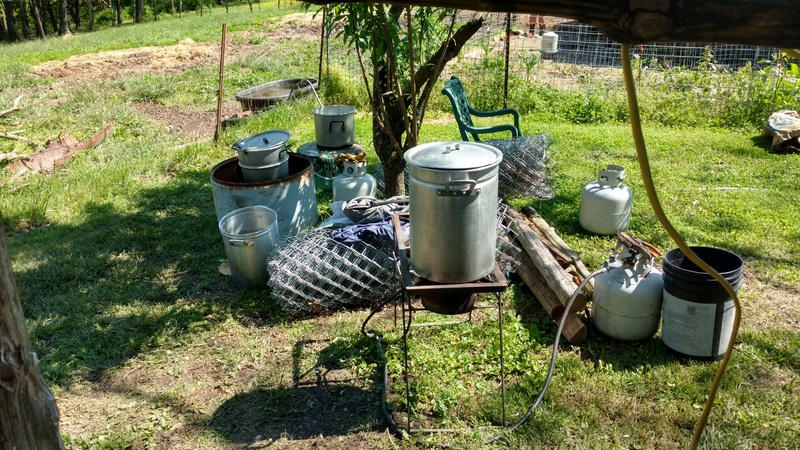 Most people that are really into wine making usually do a 5 gallon batch in one shot so if that interests you and you want to try to go cheap on that as well–go to a bakery (I go to Price Cutters) and ask if they have any white buckets, they are food grade. Most of the time they are frosting containers; the last 3 I got were. Point is, they are free and most likely are going in the trash anyway and they almost always have the lids with them. If they don’t have any (at least in my personal experience) they’ll hold some back for you and you can pick them up in a few days. So all you’ll need is to drill a hole in the top and add your stopper and airlock. Crack or crush one Campden Tablet and add to the above mixture. Attach the fermenter lid and airlock. 24 hours later, remove the fermenter lid and add the yeast. Reattach lid and airlock and allow the wine to ferment. If you have the fruit in a straining bag, after about ten days, sanitize rubber gloves or your hands and remove the bag of fruit pulp. Squeeze as much juice as you can from the bag, then top up the fermenter with water to the original volume (to account for the volume of fruit pulp you have just removed). If you have used fruit juice, you can bypass this step. Reattach the lid and airlock and allow the fermentation to complete. Once the wine is finished fermenting, siphon it into a secondary container and allow it to clarify. When the wine is clarified, add 1 more Campden Tablet and Potassium Sorbate per our label instructions. Let the wine sit for a few days. You might need to use one of the chemical clarifiers to speed up the clarifying process, or the wine might clarify on its own. Every wine is different. 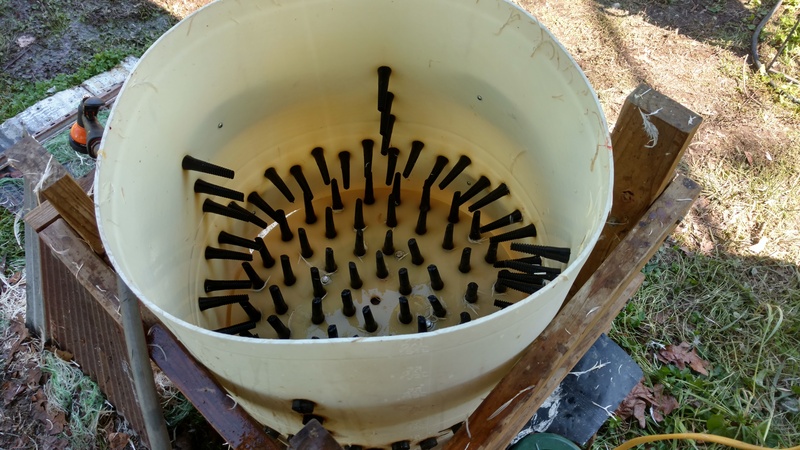 Sweetening finished wine (This step is totally optional, but the basic process is as follows): After the wine is clarified and stabilized, rack it into another carboy to get it off the sediment from the clarification and stabilization process. Thief out a 1 cup sample and add granulated sugar 1/8 teaspoon at a time, stirring to dissolve it, and taste until the desired level of sweetness is reached. Then multiply the amount of sugar used in the sample by the number of sample volumes in the total (there are 16 cups in 1 gallon, for example). Using the sugar amount arrived at by the multiplication, add ½ teaspoon of acid blend (or tartaric acid, or whatever granular acid you are using) and bring this mixture to a boil in 1 to 2 cups of water. Cover it and allow it to cool. Pour it into the carboy with the wine, stirring gently. (If you have a really full carboy, you will want to siphon out a volume of wine equal to the volume of the sugar solution you are adding.) Let the wine sit for a few days to one week to make sure it does not restart fermentation after adding the sugar solution. If it is still clear and has not started re fermenting, it is ready to bottle. NOTE: You can also adjust the acidity of the wine at the same time you adjust the sugar level. If the wine is sort of bland, that means it needs more acid. Add acid blend (or whatever acid you are using) 1/8 teaspoon at a time to the same sample you are adjusting for sugar level, and do the same multiplication up for the total volume that you use to adjust the sugar level. Here’s the recipe from their website which is the exact same as the recipe you just read. Dandelion: Not just a weed folks! Most people see Dandelion flowers and completely lose it. It’s annoying and in their yard, EVERYTHING must be immaculate, no dandelions aloud!!! Uh… Obviously, this isn’t me and I’ve never been the “immaculate” yard keeper anyhow… I live on a farm/homestead. I do keep our actual yard and the adjoining yards that lead to the barn mowed down because if we don’t… Snakes show up. I can handle the black snakes, they have a purpose but not the ones of poisonous persuasion. There again, once black snakes start eating duck eggs or anything… They are on my list. Before Jeremy does that first cut though, I saw “WAIT!” I try and collect the dandelions for different odd and end things which I’ll post about some other time! I think most things have a purpose even if our society today doesn’t see much use in them, the example being dandelion for this post. So earlier this November I was trying to get my ducks and chickens to do a little digging in my garden so I put out some feed. While doing this, I saw a huge dandelion plant. Looking around, there were actually quite a few; I already had the potato fork so I dug them up. They came out pretty easily because it had rained the day before so the soil was manageable. I actually had hopes that I would have time to make Dandelion Coffee (So I’ll do a separate post sometime about that) but I never got the time so I looked up what else the roots were good for. Usually when I’m curious about a particular plant I go to The Herbal Resource. Put dandelion root in a jar and cover with 100 vodka. Make sure you at least cover with an inch of vodka above the dandelion roots. Cover tightly and allow to steep for 6 weeks, shaking daily. For optimum health, take a few drops daily in juice or water. **Though I want to be helpful to you with information; do you own research so you always have a better idea about things as well!! Where did this idea come from? Well, I was trying to think of ways to produce my own sugar on the homestead and I figured the easiest way to do that was grow sugarcane. I researched it and back in the 1800s they use to grow it here in Missouri but it doesn’t seem like they do it anymore. Sugarcane does better in climates that are tropical so the next thing I came up with was growing sorghum. The crazy part of all of this was that I just decided to do it and figured things would fall into place. We went to Baker’s Creek Pioneer Village in Mansfield where they sell heirloom seeds and we purchased a few seed packages containing the Black Amber variety. I planted them in May of 2014. They grew like crazy and I had researched mills and substitutions of mills and I knew I couldn’t afford a new or used mill so I read some blog that said you could use an old wringer washer. I did find a neighbor that had one but looking at it, there was no way it was going to work at least in my mind. The days started to accelerate towards September when the the stalks would be ready and we still didn’t have a mill and I started to panic because we still didn’t know how we were going to get the juice from the stalks until one day my husband and I were talking and he said, “What about Bert?” Anyone around this area knows Bert. He has everything. He’s just an old retired guy that tinkers around on different projects constantly. So we decided to go to Bert’s. We pull up into his driveway and got out and started walking towards his front door and there is this rusty looking piece of machinery a few feet from the door. Jeremy says, “Babe, I actually think this is what we’re looking for.” We knocked on the door and we asked Bert what it was and he said it was a sorghum mill. He just pulled it out a few days before so he could sell it as a yard ornament to someone. We asked how much and he said $100 so we bought it. I think that mill was meant for us! It was seized up and needed a bit of work but Jeremy got it going pretty easily. It’s a smaller sized horse drawn mill but it did the job. So how do you know when it’s ready? That’s all based on the seed heads. Also, it’s a preference to whoever does it has well. Some actually will dehead early to increase the sugar levels in the stalks. What we do is test the seeds. Grab a seed from the head of the stalk and try to break though with your thumb nail. If it goes through easily and its white like milk. It’s the milky stage and that would actually be the time to dehead if you were going to which we don’t. We like the soft dough to hard stage which is when you can’t break the seed. To us, I kind of feel like that comes by pretty fast so you have to check weekly to make sure. I also pay attention to the date I planted. Most varieties of sorghum will range from 100-120 days to maturity. When the stalks are ready, you need to cut them down. I usually just use loppers. They need to cure which usually boosts your sugar content as well. I’ve tried a week and less and the happy amount for us is about 3 days. You have a choice to strip the leaves before they are cut down or after. I let the stalks cure out for 2 days in hopes that the juice goes to the stalk and out of the leaves. I don’t know if that is accurate or not, it’s just what I tend to do. After you stripped the leaves and deheaded they are ready to go. The processing day is a long one so start really early, it’s an all day event which is why we have “Sorghum Days” and we invite friends out to be a part of it. We didn’t have my mother in law’s plow horse so Jeremy rode for 6 hours… Needless to say he was saddle sore! Oh yeah, I should also mention. We make sorghum syrup. Many people think that sorghum is molasses but molasses is actually a byproduct of sugarcane. Anyway, back to it now that the sorghum is ready to be processed, that’s exactly what you do. You put the stalks in the biggest end first and just keep going until you’re done. The raw juice needs to be filtered. 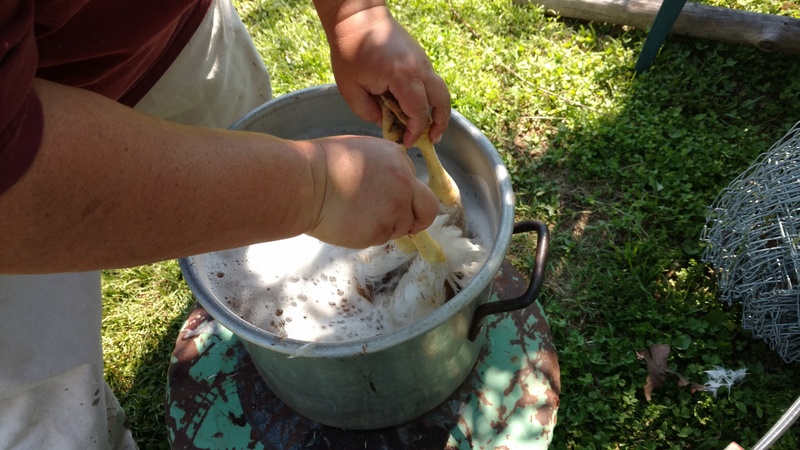 We use cheesecloth and it works pretty well then we use a propane burner and start cooking it down. While this is being done green stuff will rise to the top. That is impurities and needs to be skimmed out and it is called “Scum.” Eventually it will start to turn brown and get thick but it takes quite a while. This is a picture of my grandma Fern from 1944 processing sorghum. Hope you enjoy this post! Any questions feel free to ask! I think I need to explain myself a little bit. Back in 2010 I met my husband-to-be, briefly, and didn’t have a second thought. He wasn’t my type and I remembered him from school but we are 6 years apart so I didn’t remember much. Long story short, we became friends on Facebook and one day I was shamelessly bragging about my guitar skills while singing Free Fallin’ and all that and then some. Jeremy called me out on it to prove it and my egotistical self couldn’t say no so we had dinner and I played some music and we were really good friends for a bit then it moved to we were a couple. He lived on a big farm and was taking care of it for his family and after I moved in, we got married (Yes, I know we did things a little backwards but we’re all good now). My point is, I thought I was country. I lived in the country most of my life but I definitely didn’t live country. Especially when Jeremy needed help with using a tractor to lift or move something while he guided on the ground, I had to work the hydraulics… I always fought change so afterward I took off and said, “I don’t want to be a country girl anymore.” I know, childish but change freaked me out. Now I’m more seasoned and I look for opportunities to try new things so I’ve made a lot of progress but I do remember a time before when I was new to all of this. Which brings me to making butter. Put cream into food processor to the fill line and turn on. It will take a few minutes unless it’s not very thick cream then it will take a bit longer. You’ll notice a difference in sound because it will thicken up into whipped cream and then right past that stage is butter. Let it go long enough that it’s a bright yellow. Colander needs to be over a bowl, strain butter. The milk left over is “Buttermilk” but unless you leave it on the counter for 12 hours, it doesn’t have a culture in it so it won’t have a buttermilk taste. Depending on your situation or what works best you need to clean your butter of milk so it won’t sour. The easiest way for me is to turn the cold water on in the sink and push my thumbs into the butter to squeeze out the milk and “Clean” it. Another way is get a bowl with cold water and knead the butter. You’ll have to change the water several times. When it’s milky, change it. When it stops getting milky then it’s clean. Once you’ve got the cream made into butter, I usually take and squeeze out the water if there is any from it either with my hands or a spoon. Then add your salt. I prefer Pink Himalayan Sea Salt just add a little and taste to see if that’s what you like. Since I have a lot usually I weigh it out into 1/4 lbs. which is a stick sized amount and freeze it for later use. This is the butter balls in water. They’ve already been cleaned under running water under facet while kneading the milk until clean.